When I got home from work today, I just felt stifled by all of the plants and stuff on my front porch! I just started cleaning! I scrubbed the porch with soap and water and a broom! I moved a large ice chest, and some shoes my husband wears to cut the grass. I took all of my succulent plants and moved them to their new sort of home base (these are the ones who need partial sun, or a little protection)...in my screen room out back. I put them all over two plastic tables out there, for now. 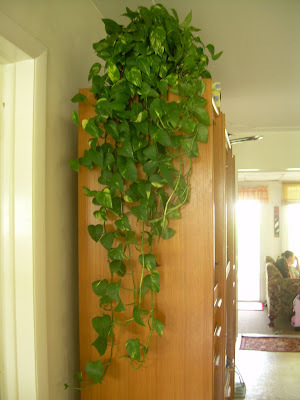 I moved a huge Pothos (which was on the top of my cinderblock shelving) and took it in the house and placed it at the end of my entertainment center, so you see it right when you come in the front door (a nice Feng Shui touch, don't you think)...and here is what it looks like! It has grown very lush out there, kind of as I wasn't looking....it was a pleasant surprise to find it so thick and LONG! So here is how my shelves ended up looking on the front porch when I got finished! Here is a close up of the really nice set of characters from Wizard of Oz, my daughter and I found while thrift shopping a few weeks ago...I love them for here because they are made of a high quality plastic, and are safe from total destruction, anyway! My husband always says I live in a fantasy world, and I suppose there is some truth in that!!! 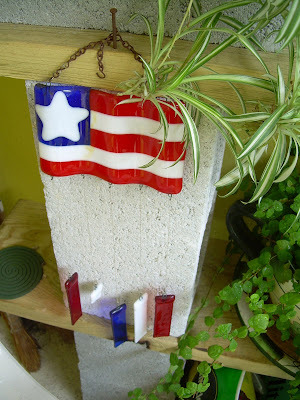 I found this glass flag windchime at a artist sale a few years ago, and you can see a peice of one of my chimes broke off. I have the peice around here somewhere...I just need to fix it with my E6000 glue. 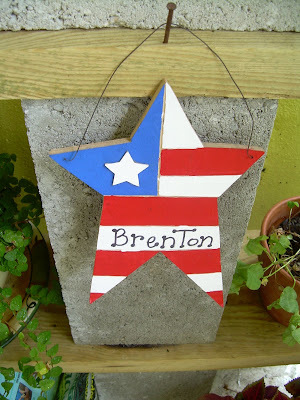 I painted this wooden star to remember my son who is currently serving in the U.S. Army, and I think of him and his family every minute and pray they will stay safe! I am very proud of him, as you can see! 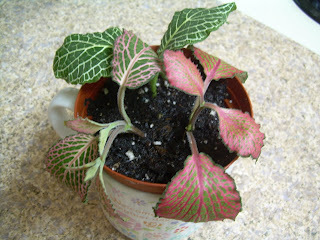 I agree that I should showcase my own plants on the righthand side of the blog. The other picture was neat and orderly and had a nice way about it, but it wasn't really colorful like me and my plants...sooooo...I changed my photos, and also picked a different template that took up more of the screen...(the other one was too narrow), and included my latest baby in the top slot, lest I not forget her!!! I want to try and sketch her too, Teri, at some point! Maybe this weekend I will give it a try. 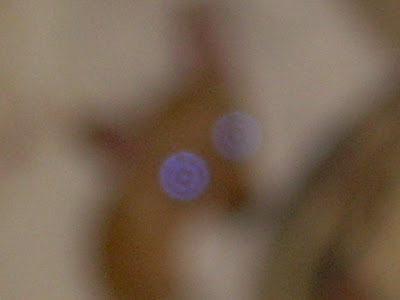 Be on the lookout for a very strange looking thing that you can't hardly make out!!! LOL. Today was very odd for me...I had no "get-up-and-go"! It was all I could do to get through my workday. I had more of a "lay-down-and-sleep" feeling! Luckily, I maded it through...and now I am wide awake, at midnight...of course! I got bored tonight and decided to change my template for the blog! I really like this one with all of the green. It looked good instantly after I clicked the button! No other changes needed, except to change my photo pic to one that my daugher took today at the plant sale, of this table of succulents. 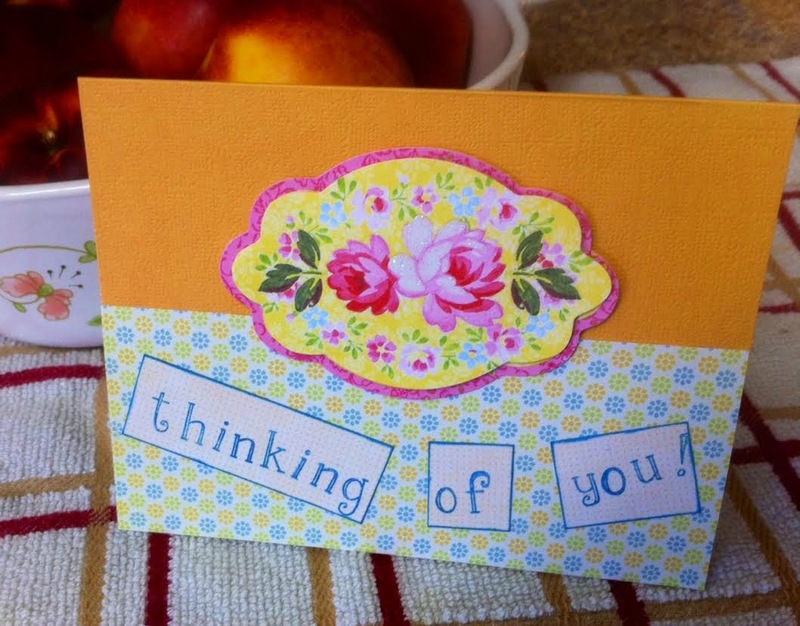 I loved it, and immediately thought it would be perfect for the blog! I was right! Today I went to a plant sale at Mounts Botanical Gardens with my Mom, daughter, friend, and met up with my sister in law, and another friend! It was really wonderful. Perfect weather (West Palm beach, Florida), sunny, clear skies, and a cool, dry breeze! We had a wonderful time. 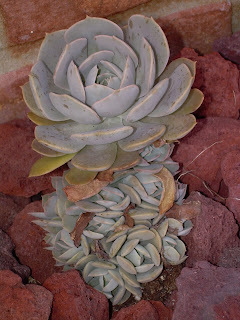 Of course, I gravitated to the succulents. I found this absolutely lovely and perfect specimen of Gasteria gracilus variegata, and fell right in love with it! I cherished it from the moment my eyes fell upon it. It is a sick sickness that I have! LOLOL. You should have seen me carrying it with both hands and close to my chest, as I occasionally gave it a sort of kiss now and then! Hee hee hee! I was in heaven! Enjoy the pics I took of it once we got home! Well, this evening I was over at Home Depot, and I actually found one of those orange sun bromeliads...for 35 dollars! They only had one, and it had a pup attached too, but it was fairly beat up, so I decided to wait and buy some online. 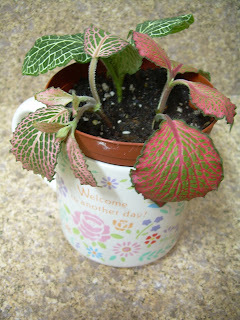 I can buy smaller plants in much better condition, and for a lot less money too! 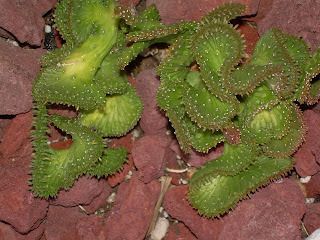 As I was leaving, I HAD to pass by the succulents, and upon close inspection I found these 3 rather unique (to me) plants. I potted them up together for now. I think they look nice together in this big clay pot I had. 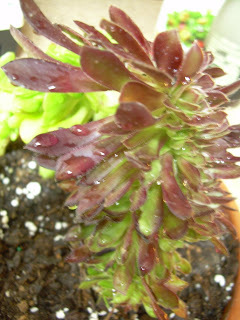 The little one in the front is called Sempervivum Rebellum Mohogany of "Live Forever"
You can see that the cristatas are on thick bases and on the side where the growth comes out I got photos of these sides, and you can see how full and bushy they are. They remind me of stegosaurus dinosaurs, with the plates down their backs!! I definately could not resist them. I wonder how they will grow, what they will do as far as size, and growth pattern. 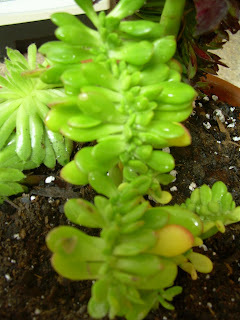 That is the beauty of succulents...they are just plain fun! I tried an experiment and stuck a peice of all three of my Fittonias in a glass of water...and yippeeee...they rooted...EASILY!!! Now, guess who will be rooting these babies ALL THE TIME, and using them for gifts, and oh just everything. 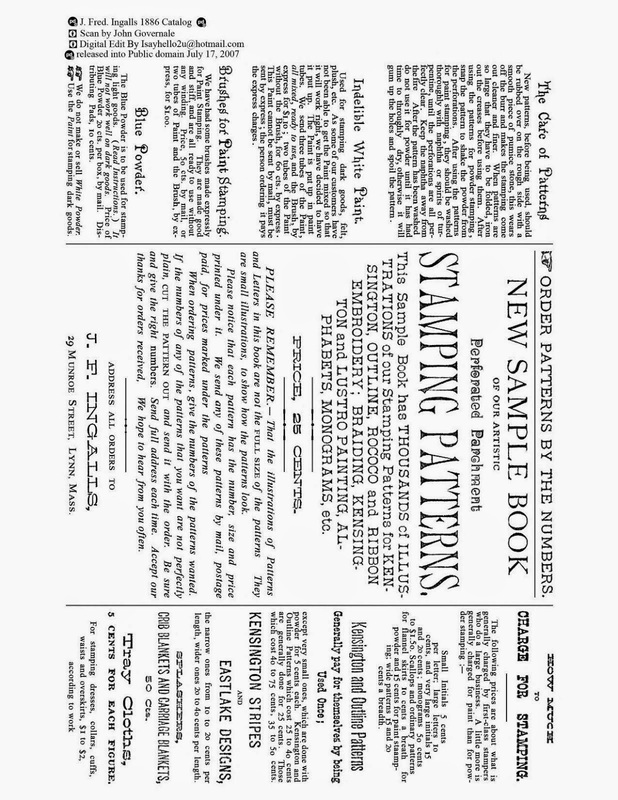 Maybe this is the time to start growing and doing plant sales! WOW...did I just say that...could I be so industrious after working all day??? Hmmm...doubtful...but yet the idea is intriguing! I do love my Fittonias...they are just so great indoors in low light...about as perfect as they come!!! Woo Hoo!!! It is LOVE!!! My husband and I took Doozey (AKA LullaBelle) for a walk, and ran into the first set of neighbors who own Homer, a white Pekinese (not shown), and then we ran into Steve, who owns Daisy, an adorable Beagle (not shown). Then we ran into my cousins who own this cute little kitty, named Taco (a male), and of course you remember their dog, Buster! Doozey (in pink) had a good time playing with them. Oh...and then this little black Min Pin named Lola came along too. 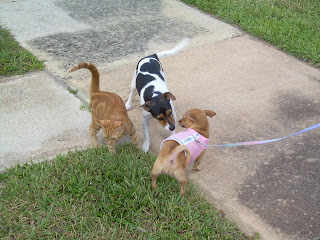 This is how it goes every evening when we all go out walking after work...it's a lot of fun running into everyone...especially for the animals!!! It's part of a succulent life, what can I say??? LOL. OK...you may want to sit down to view this!!! WOW...they are even prettier in photo!!! I took these pics at around 5:30 pm on my way home, and the lighting was perfect! They were just glowing!!! There is no added color or effects to these photos...this is REAL color! What do you think??? I went to Lowes and Target after this, and met a lady at Target in the garden area...she gave me the phone number for a nursery where she works out west of town, and she will be there at 7:30am. She said to call her and she would tell me if they had any right now!!! I wonder how many I should buy...I am thinking 6 to start! They will frame my succulent tires somehow!!! Oh... maybe 10!!! Click on the photos to see them BIG!!! Check out the VERY COLORFUL bromeliads HERE, called Neoregelias. One of these orange colored ones are the ones I see outside that development...once I get the pics tomorrow, I can compare...these are amazing in their colorful leaves! I want at least one of each!!! You will love these Teri and Vickie!!! 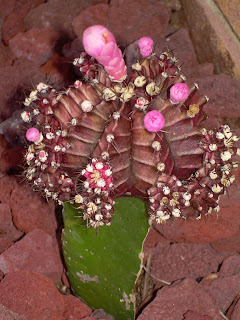 We do not see much of anything here in south Florida having to do with cactus, so this was a rare find. The little bag was filled with ground up something...it smelled pretty good...I wonder if there really was any cactus flower in it at all??? Anyhoo...I had to snap a pic just to show we had at least something cactus-y here!!! Now, if we just had some rocks!!! Isn't this stunning! 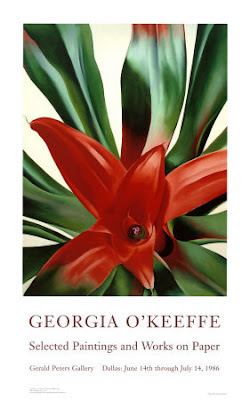 I just went to a Georgia O'Keeffe showing at our Art Museum a few months ago, but did not remember seeing anything like this! Maybe this particular painting wasn't on display, but WOW!!! Love it! I have been so busy this weekend, I haven't had much time to devote to the blog, but I will get over and take a picture of those giant orange bromeliads outside a particular development here. They are in full sun, and as orange as can be! They are very large, with wide luxurious leaves...just a spectacular entrance into the development! I keep teasing that I am gonna have to get over there in the middle of the night and dig them up for my yard!!! I will find out the name and get a few, for sure! I have decided that if I do get into Bromeliads, they will be full sun varieties, and will be added in some way around my tire gardens. 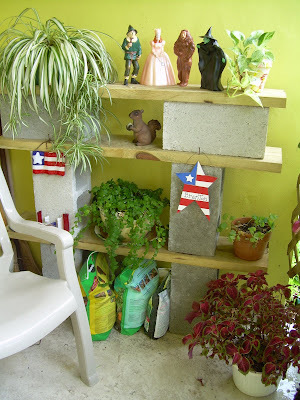 I have an idea to do a sort of rock deal, where the white rocks (Medium to large in size), will build up to the height of my tires, and gradually lower to the ground on each side...and in each hole will be a bromeliad or succulent, and it is going to be quite lovely...I can see it in my mind!!! 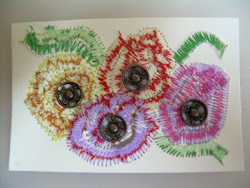 Very vivid colors also! Are you getting a sort of vision??? I am. I am tending to my Moms garden while she is away visiting her sister, and her tomatoes are still producing...I brought two good sized ones home tonight. I just got through watering over there, and now it has started to rain! Isn't that the way the ball bounces? I think I am falling more and more in love with them every day! Do I feel a new obsession coming on??? I think I do! 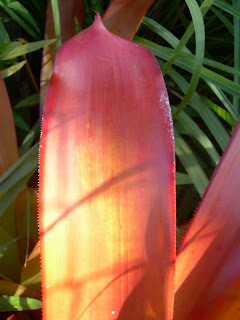 It seems everywhere I turn, I am running into some gorgeous bromeliad, or another! 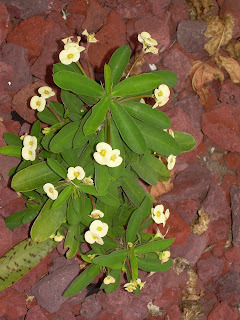 I believe they like a shady area, and I do have a very large Sapodilla tree in the back yard, that they could live under...hmmmmm....my first one will have to have an orange bloom, like the one below at UM. Those were strikingly beautiful. Does anyone else have a bromeliad collection or at least one that can give me any tips??? I think tomorow will be a perfect day for a trip to find one. Can they grow in hanging baskets under a tree??? 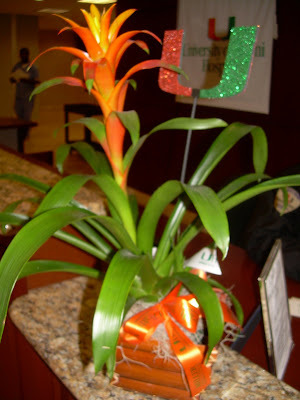 Today I have been down at University of Miami with a friend, who had to have surgery. Thank God she has done very well, and most likely will get to go home tomorrow! Her surgeon was devine! I had planned to stay in a private room with her on a cot, but the MD wanted her to go to ICU overnight! I stayed until I could see how well she was doing, and then left to find a hotel (I got to the hotel at 11pm). I ended up...I think...on Miami Beach bayfront area at a darn Hyatt! Expensive, but I did not know where I was going and was happy to find a clean, well respected hotel to crash for the night. I picked up a few teeney bottles of wine in the gift shop, and am having a few sips while I play around on my wireless internet that I had to purchase 24 hours worth of, from T-Mobile!!! Seems like the more expensive the hotel, the more stuff you have to pay for! I have to pay for my parking, and internet, on top of the massive room rate. Miami ain't cheap!!! LOL. Anyway, I decided since I am staying in the lap of luxury, to really have fun with my wine and internet...what can I say...I'm a cheap date!!! Ha ha. Oh...not to mention the hot shower with expensive soaps and shampoos I get to take in the morning!!! Hey...I have 6 pillows on my king sized bed!!! Should I order room service?????? It looks really good. Check out the bromeliads at the front entrance to the hospital (there were 3 of them on a long desk)...I thought the orange color was really great. I was walking over to my Moms (about 5 doors down), when I stopped at my cousins house (about 4 doors down)!!! LOL. 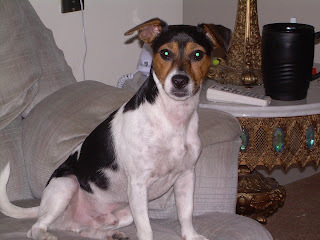 They came out with their new Jack Russell dog, named Buster! I included a pic of him, cause he is such an angel...and very handsome! 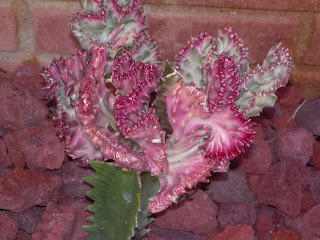 I got some good pics of several of the cactus and succulents she is growing in a little side garden that lines her front walkway. I love her red rocks...it looks very western to me! You know how I love my WEST!!! Tonight I am busy printing up my daughers high school graduation invitations and the program for same. Tomorrow all of the moms meet for further graduation planning. I believe I have the table decor covered, with daisies for our flowers. The school colors are yellow, very dark blue, and I am throwing is a little black to punch it up a bit. We are having it at a country club, to include a buffet dinner. The staff there have agreed to make us a graduation cake instead of individual desserts. That is very nice of them and it will save us one more thing to worry about. Now all we need to do is go shopping for our new outfits...Carolyn will need to wear a white dress. Should be fun! I love how the winter sun, and now continuing Spring sun, has turned my aloes a nice shade of orange! Isn't that the most fun with cactus and succulents...watching them change colors, suddenly surprise with blooms...they never fail to entertain me! 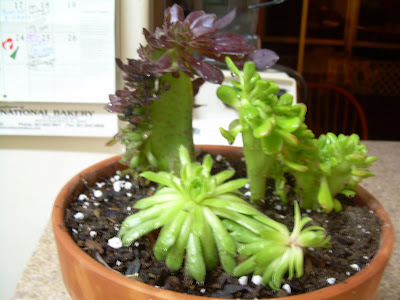 Now that my children are grown, my succulents are as much "my little babies", as my animals are! Awww...empty nesting is actually becoming fun! A hibiscus bloom for Donna in Louisiana! The Surinam cherry bushes are really producing! Sue...where are you?? ?...and a crockpot recipe!